If you live in the modern world, then it is guaranteed you will be exposed to toxins. In fact our environment has become the most toxic in history. Normally your body is well equipped to deal with many of these toxins. The kidneys, liver, intestines, lymphatic system and the skin are very good at cleansing the body and keeping it functioning healthily. But sometimes you need a helping hand, particularly if you’ve been overdoing the coffee, alcohol, sugar and rubbish foods. A new approach to detoxing is emerging which is based on sensible, evidence-based strategies, such as healthy eating . This is where detox smoothies come in. 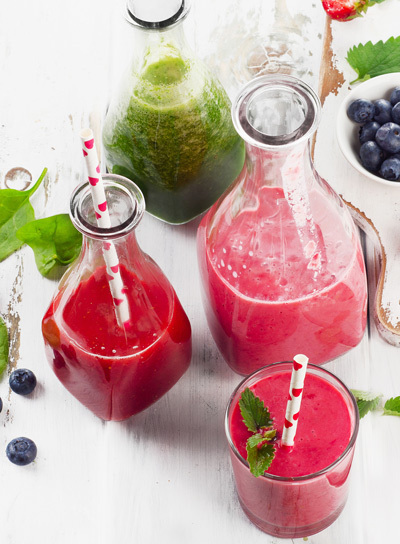 Whizzing up a healthy detox drink is an excellent way to get your wellness fix. The easiest way to detox is to completely avoid those things which we know are toxic. That’s not always possible of course. But there are things we can control and one of those things is our diet. Dietary changes such as eating more fruit and vegetables, will result in clearer skin, increased energy and a general feeling of well-being. There really is no need to rush out and buy expensive powdery shakes or liquid cleanses. Nature provides us with everything we need. The ingredients are already in your kitchen. A detox smoothie of raw fruit and vegetables, chock full of vitamins, minerals, fiber and antioxidants is just what the doctor ordered. Healthy fats such as avocado, almonds, coconut, chia, flaxseeds, pumpkin and sunflower seeds. Peel and segment the orange. 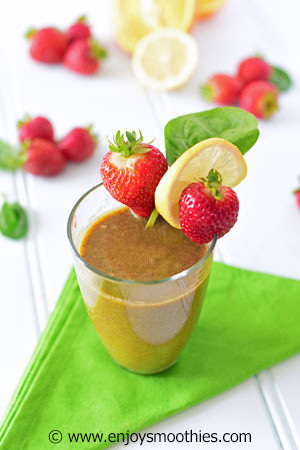 Place the spinach leaves, strawberries, orange segments, banana, almond milk and lemon juice into your blender. Blend at high speed until your smoothie is smooth. This makes 2 small glasses. The apple juice adds the desired sweetness to this smoothie. 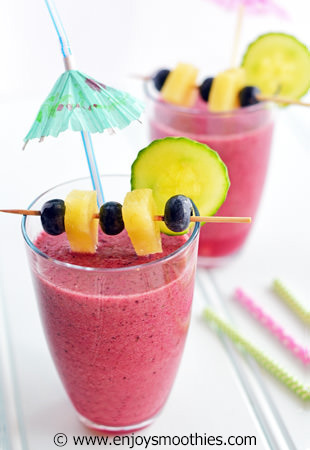 Place the pineapple, blueberries, raspberries, cucumber, filtered water and apple juice in your blender and process on high until all the ingredients are smooth and creamy. Then pour into two glasses and enjoy. Goji berries are a noted stress reliever and have been shown to enhance feelings of wellbeing. Soak the Goji berries for 10 – 15 minutes prior to making your smoothie. 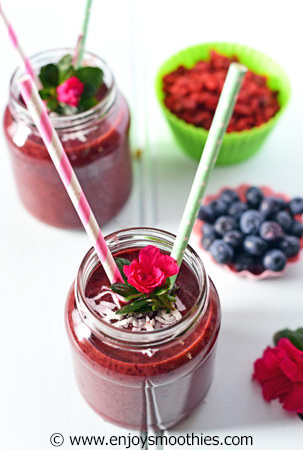 Combine the blueberries, blackberries, raspberries, Goji berries, coconut milk, flaxseed and in your blender. Blitz high until smooth and creamy. Blend again then pour into two glasses. Put the spinach leaves into your blender first then add the orange, pineapple, mint, lime juice, grated ginger and water. 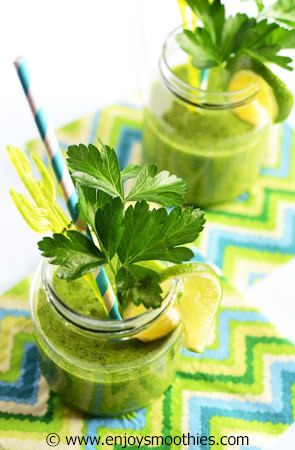 Give your blender a whizz until you have a wonderful green smoothie. Peel and chop the kiwi and orange. Chop the pear into quarters and remove the core. Leave the skin intact. Place the spinach leaves into your blender, then add the kiwi, pear, orange and filtered water. Blitz it all together until everything is smooth and creamy. Peel the orange and mandarin and divide into segments. Throw the kale leaves into your blender, then add the orange and mandarin segments, mango, almond milk and lemon juice. Blend until smooth. Then pour into 2 glasses. Soak the chia seeds for 10 – 15 minutes beforehand. Then add the kale leaves, beetroot, apple, pear, chia seeds, water and pomegranate juice to your blender. Whizz together until smooth. Add the lettuce leaves, banana, pineapple, strawberries, almond milk and grated ginger to your blender. Blend until your smoothie is thick and creamy.